„I gave them what they wanted. Money talks, but it can’t sing and dance…“ That’s how Keith Hufnagel explained his efforts to get Dylan Rieder and Austyn Gillette onto the increasingly successful HUF train. After the first leaked pictures of Dylans HUF pro model, people realized that he kept his word. Given that the team is rather small, and HUF was an expanding brand without (back then) major financial backers, a controversial shoe like the HUF Dylan was deemed a risky business move that’s hardly ever made, much less so one that proves successful. This proves that HUF is willing to take risks. It also proves that Dylan gets the chance to showcase his line of interesting designs that have their own distinctive style, like Dylan himself. 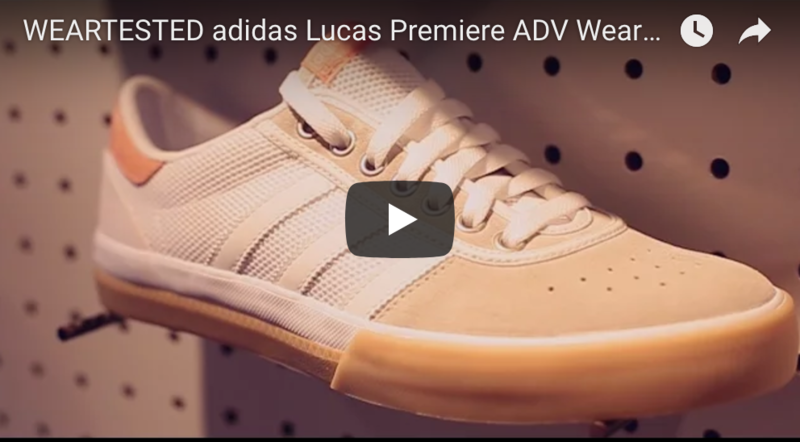 We here at weartested are quite stoked to see something different and bold on the skateshoe market, which made it even more of a pleasure to test this model. Whether this unique design is also a guarantee for good skateability is what we will find out now. The HUF Dylan fits rather small (see the chapter about shape), so we would advise you to try it on in the skateshop of your choice. The HUF Dylan is exceptionally durable. Its whole toebox and general front foot area is lacking any major seams and made of extremely durable suede. This makes sense since most skateboard-related signs of use can first be seen in those areas. The suede revealed hardly any signs of wear, and the leather did not even show the usual slight grooves caused by griptape contact. Since there are no critical seams around that area, ollie holes or other openings were fully prevented. The eylets for the laces are rather wide up and close to each other, which means the laces are protected pretty good as well. Even the rubber around the usual flick area showed hardly any signs of wear. The cushioning abilities of the HUF Dylan are rather average. The cut clearly shows that a combination of traditional sole construction combined with some innovative design elements were used. The sole itself features a slightly higher heel than its frontal area, which leads to a nice fit and protection of the heel. The sole itself is still too thin though, which decreases its cushioning abilities. To counter that, HUF uses a thicker foam insole, which gets thicker towards the heel. It improves cushioning, but still, all the stair jumpers will be left without much protection. Shape is a crucial design element for the HUF Dylan. It is very tight and long. Its entry area is really slim as well, but the shoe gets wider towards the mid-foot-area. The toebox itself is slim and pointy; overall, people with slimmer feet will enjoy this model much more. Since the shoe features basic qualities when it comes to cushioning, boardfeel is rather good. The sole throughout the whole toebox and frontal area is really thin, which in combination with its great grip, leads to great contact with the board. Grip did not decrease throughout our 10-hr test. Then again, the sole does not feature any special structure or grooves to increase flex. 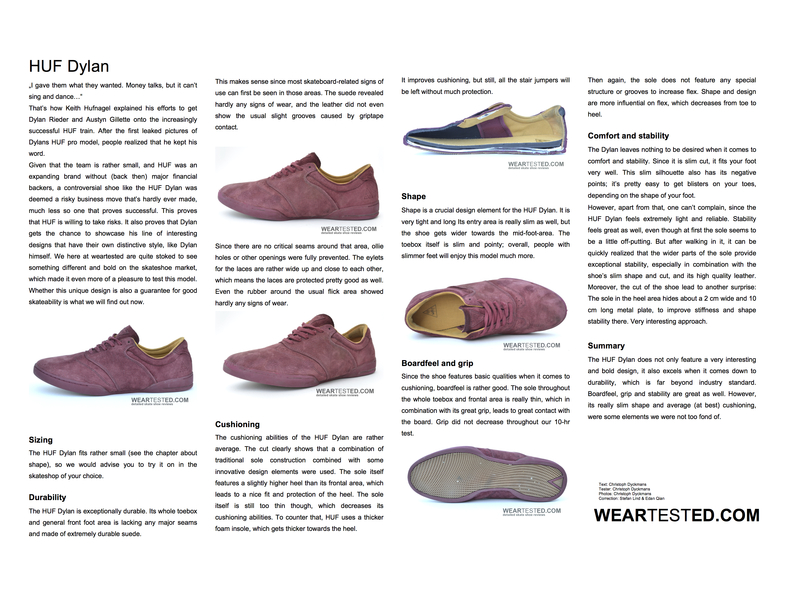 Shape and design are more influential on flex, which decreases from toe to heel. The Dylan leaves nothing to be desired when it comes to comfort and stability. Since it is slim cut, it fits your foot very well. This slim silhouette also has its negative points; it’s pretty easy to get blisters on your toes, depending on the shape of your foot. However, apart from that, one can’t complain, since the HUF Dylan feels extremely light and reliable. Stability feels great as well, even though at first the sole seems to be a little off-putting. But after walking in it, it can be quickly realized that the wider parts of the sole provide exceptional stability, especially in combination with the shoe’s slim shape and cut, and its high quality leather. 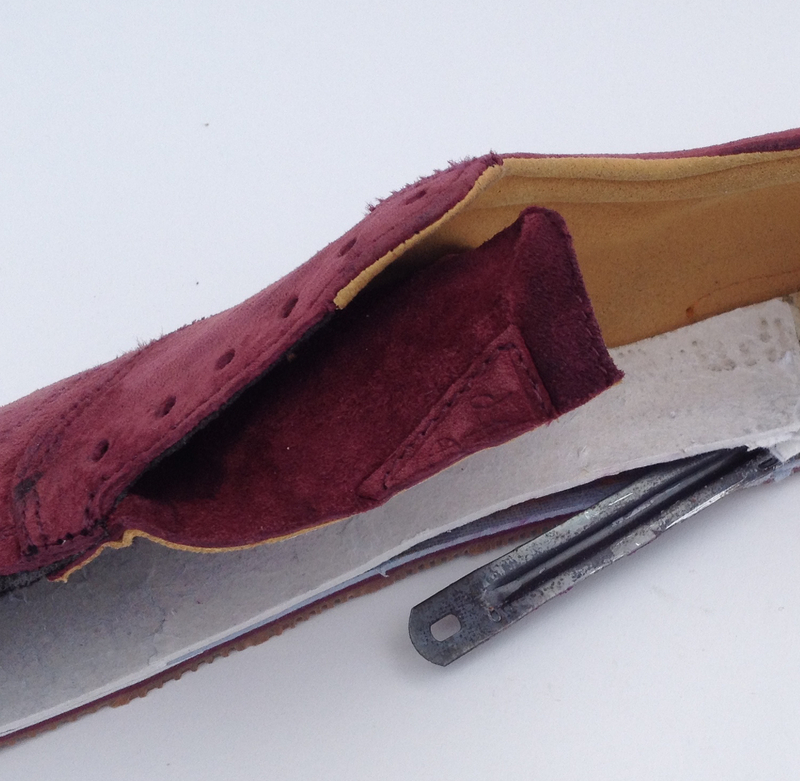 Moreover, the cut of the shoe lead to another surprise: The sole in the heel area hides about a 2 cm wide and 10 cm long metal plate, to improve stiffness and shape stability there. Very interesting approach. The HUF Dylan does not only feature a very interesting and bold design, it also excels when it comes down to durability, which is far beyond industry standard. Boardfeel, grip and stability are great as well. However, its really slim shape and average (at best) cushioning, were some elements we were not too fond of.